In this section you will either select the Company Default for email settings or you can add a custom email for this particular user. 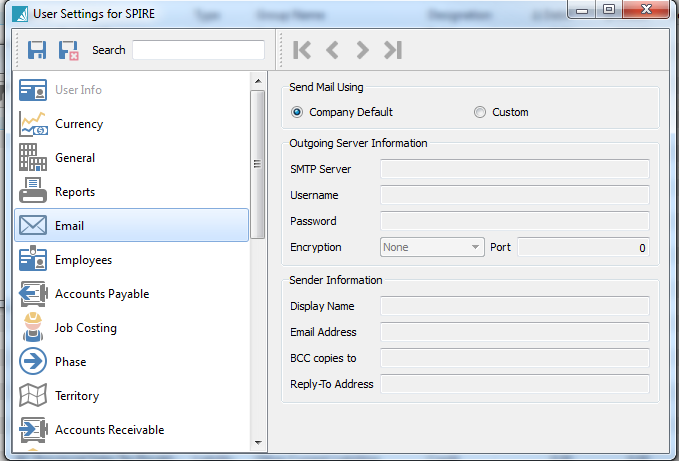 If left as default, the email settings will come from the company email configuration. SMTP – This is the internet provider’s SMTP information. Username – Usually their email address. Password – Usually their email password. If the provider does not require secured SMTP this may be left blank. Encryption – Many providers require encryption to be on. Encryption Ports – 25, 465 and 587 are common. Display Name – The name of the sender. Email Address – The senders email address. BCC Address – The address the sender wants copies of the email sent to. Reply-To Address – When the recipient replies, who will get the message? *It can sometimes be tricky to get the correct info from the internet provider so this is why we always test with a known address to prove all the necessary firewall settings are correct.